This is a large, full function gas grill that sells out of Lowe's for around $850USD. You get everything with this grill except the rod for your rotisserie, a cover and a propane tank. Other than that you get an infrared side burner (better for searing steaks than heating pots), lots of cooking space and internal grill lights. The downside of this grill is the lightweight stainless steel (all 304) construction and a problematic infrared burner. 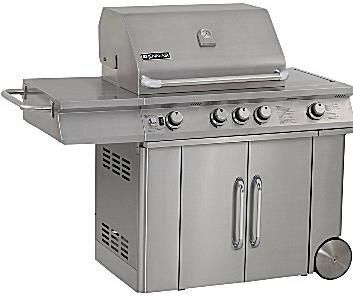 This isn't a bad grill, it just isn't a great grill and at the price, it should be a more reliable unit. Sold exclusively through Lowe's Home Improvement Stores. Imported by Nexgrill. The Jenn-Air gas grills from Lowe's Stores have been discontinued. There have been a lot of problems with support for this line of grills in the past. Recently Nexgrill has introduced a new line of support (basically a subsidiary company) that is intended to help with this problem but issues seem to continue. This grill gives you a good deal of power from three stainless steel burners at a total of 45,000 BTUs under about 450 square inches of cooking space. You also get a unique infrared side burner (out from under the main hood). This sear station burner is a nice feature, but several people have reported problems with the ceramic tile breaking, but Nexgrill has been replacing the broken parts. You will also get a 10,000 BTU rear mounted infrared rotisserie burner. There isn't a great deal of space between the rod and the burner on this rotisserie layout so no turkeys for you. Get inside this grill and you find thin, poorly assembled pieces at the heart of this grill. Add to that the service issues and this is one grill I would hesitate to buy. While this is a good grill with great features for the price, you should be shopping around more.